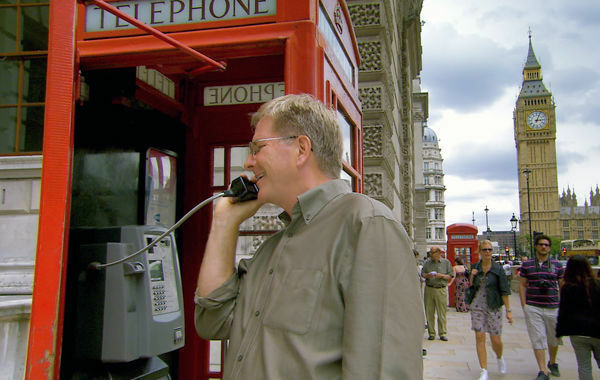 Using one of Britain's iconic phone booths is practically a cultural experience. Many hotels offer a shared computer and printer tucked in a corner of the lobby. If you prefer to travel without a mobile device, you can stay in touch using public telephones and computers. You can make phone calls from your hotel, public phones, and call shops. Phones in your hotel room can be great for local calls and for calls using cheap international phone cards (described below). Otherwise, they can be an almost criminal rip-off. Most hotels charge a fee for placing local and "toll-free" calls as well as long-distance and international calls — always ask for the rates before you dial. Since you'll never be charged for receiving calls, it's better to have someone from the US call you in your room, rather than the other way around. Note that smaller, B&B-type accommodations often don't have a landline in each room. While public pay phones are on the endangered-species list, you'll still see phone booths and banks of phones in post offices and train stations. Pay phones generally come with multilingual instructions. Most public phones in Europe work with insertable phone cards (also described below). While some card phones also accept coins, most don't. Press the "follow-on call" button (rather than hanging up) to make another call without losing your credit. You'll see many cheap call shops that advertise low rates to faraway lands, often in train-station neighborhoods. While these target immigrants who want to call home cheaply, tourists can use them, too. You'll be assigned to your own private sweatbox, make the call, and pay the bill when you're done. Before making your call, be clear on the rates. For example, the listed price may be per unit, rather than per minute — if there are 10 "units" in a minute, your call costs 10 times what you expected. Europe uses two types of telephone cards. You can find them at many post offices, newsstands, street kiosks, tobacco shops, and train stations. Insertable Phone Cards: These cards, which can only be used at pay phones, are available in most countries (but not Britain). To use them, simply take the phone off the hook, insert the card, wait for a dial tone, and dial away. The phone displays your credit ticking down as you talk. Each European country has its own phone card — so your German card won't work in an Austrian phone. International Phone "Cards": These cards let you make inexpensive calls — within Europe, or to the US, for pennies a minute — from nearly any phone, including the one in your hotel room. You'll either get a prepaid card with a toll-free number and a scratch-to-reveal PIN code, or just a code printed on a receipt. If the voice prompts aren't in English, experiment: Dial your code, followed by the pound sign (#), then the phone number, then pound again, and so on, until it works. National telecom companies in some countries (including Germany and Great Britain) levy a hefty surcharge for using one of these cards from a pay phone — which effectively eliminates any savings. But you can still use them cheaply from your hotel. In Europe, finding a place to get online without a mobile device isn't difficult. A number of hotels have a computer in the lobby for guests to use. Otherwise, head for an Internet café, where you can pay to use a public computer. Even towns without an Internet café usually offer some way to get online — at libraries, bookstores, post offices, tourist offices, and so on. Ask your hotelier for the nearest place. If you can't locate a special character (such as the @ symbol), simply copy it from a Web page and paste it into your email message. Often a simple keystroke or click of the mouse can make the foreign keyboard work like an American one. Many computers have a box in the lower right-hand corner of the screen where you can click and select which type of keyboard you prefer. If not, ask the clerk for help. You can even make Internet calls on some public computers. Most European Internet cafés have microphones and webcams built into their machines. With a Google or Skype account (most public computers have Skype installed), you can just log on and chat away.